In my opinion, the obituary is one last chance for others to know we were here. It’s thrilling to me that one can easily access information about our ancestors and others who have gone before us through a permanent record of our lives, loves, and foibles on the internet. A friend sent me a link to a really obituary yesterday. I enjoyed reading about the life of this obviously colorful man. 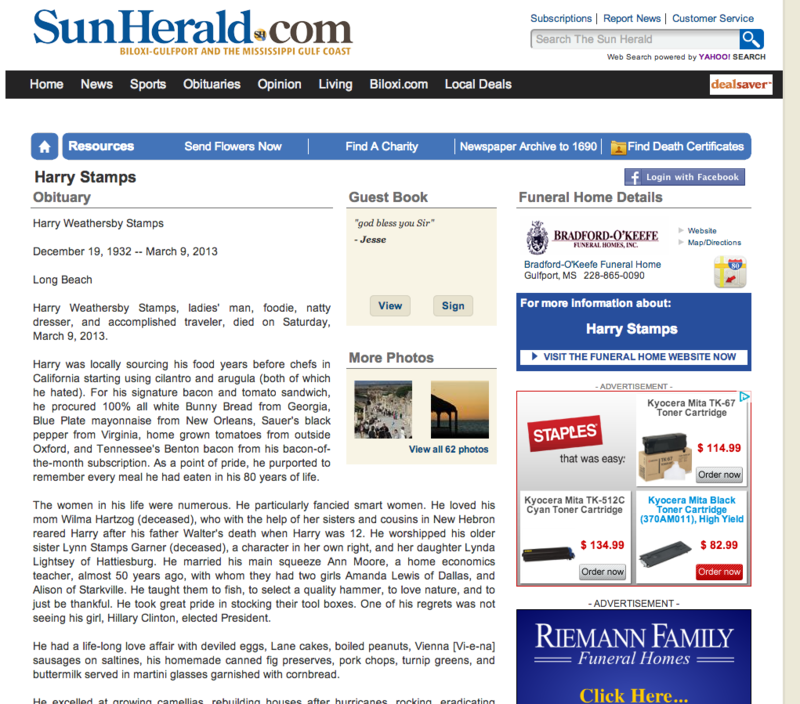 If writing obituaries is an art (and I think it is), then the author of this one for Harry Weathersby Stamps deserves a prize. In my last blog, I told about the story I had heard years ago about the death of my great grandmother, Bertha. As she died, in May 2012, there was a freak snowfall in Michigan. This site actually confirmed the story. I simply selected the area, the year, and the date in question, and the weather report of that day appears. Although probably not typically thought of as a genealogical tool, this handy resource could help confirm or disprove memories of events or possibly even assist with confirming a date in a picture or journal. 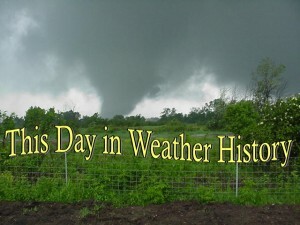 The National Weather Services website’s “This Day in Weather History” is a handy tool to keep on hand, just in case. My grandma Ariel often talked of her mother, Bertha, and her death at age 30. Her mother had suffered through several pregnancies and early deaths of her children. I know there were at least 10 pregnancies, and seven live births in a 12 year period. Grandma was never quite sure what caused her mother’s death. She knows there was another pregnancy, and an abusive husband may have been involved. Today, my husband and I were driving home from snowy upper Michigan, we were discussing how late it could possibly snow in this state. I remembered that it snowed once on my son’s birthday, the year I gave him a sandbox. He was born on April 29th and I have pictures of him at age 3 or 4 playing in his new gift in the snow. 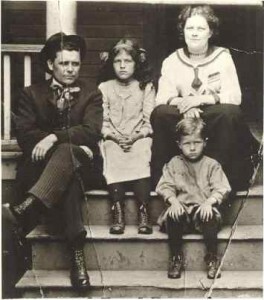 I remembered the story of my great grandmother Bertha’s death. She was in bed, close to death and her mother arrived from Canada to be with her at the end. At one point, my grandma (who was 12 at the time) remembers that the doctor looked out the window and told Bertha that it was snowing. Bertha didn’t believe him, so he went and scooped some snow off the windowsill and took it to her to show her as she lay her bed. Bertha Estelle Watson, nee Rushton, died on May 15, 1912. On May 13, 1912, Detroit reported a record for the latest snow accumulating an inch or more. The snow was measured at 1.5 inches. Wow! Isn’t exciting to find corroboration for a family story?